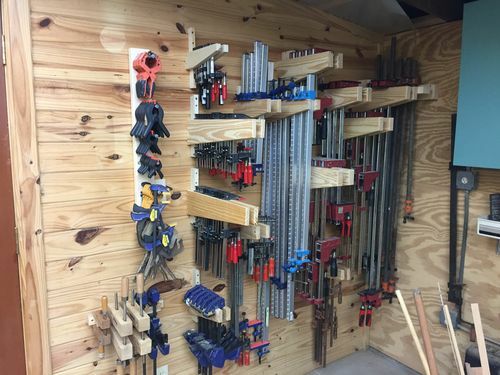 I like it, especially having all the small clamps on the wall instead of in a drawer where I have mine. There’s an efficiency idea for the F-type clamps I may want to steal. Good pic, good post, nice rack! Very nice. In the middle of reorganizing my garage and I’m like Rick – no space. Scratch that. There is space, but I put in a lot of shelving years ago using no foresight. Maybe I should rip some of it out. Some of mine use the same approach, but that yours appear to be adjustable is a HUGE plus. Nice all the way around.